For the first time in more than 70 years Citroen is using a supplier other than France's Michelin SA to provide tires for a European-assembled vehicle. Bridgestone Corp.’s premium Potenza 17-inch tires are standard on so-called SportChic performance versions of the new Citroen DS3. Michelin supplies the DS3’s 16-inch tires, which are standard on all lower-end versions of the DS3. Bridgestone also supplies the DS3's less-expensive platform sibling, the second-generation C3, with 15-inch tires. Michelin has had a long-standing partnership with Citroen and actually took control of the automaker in 1935, with Pierre Michelin appointed as the brand's president. The tire manufacturer had a share in Citroen until 1974, when it sold its interests to the Peugeot group. 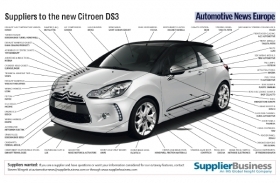 Citroen launched the DS3 to help push the mass-produced French brand more up-market. To help achieve that goal the DS3, which competes with the Mini and Fiat 500, offers a large number of special options to the customer. Faurecia SA contributes by supplying customizable instrument and door panels. The French partsmaker, which is controlled by Citroen parent PSA/Peugeot-Citroen SA, also provides a dashboard available in a range of colors, fabrics and materials. In addition, Faurecia provides the exhaust system, acoustic package and the metal-polypropylene hybrid front-end carrier, designed to give improved pedestrian protection. Integrated into the front-end are Visteon Corp.'s headlamps, which are also designed to absorb energy following a collision. Other noteworthy suppliers include ZF Friedrichshafen AG, which supplies the DS3's clutch; Lear Corp., supplier of the complete seats; and Robert Bosch GmbH, which contributes to the braking system. The DS3 comes with a choice of five engines that meet the Euro 5 emissions standards that take effect later this year. The lineup includes two diesels and three gasoline engines. Citroen is scheduled to produce 600 DS3s a day alongside the C3. The cars are made in Poissy, France. The DS3's price starts at 15,400 euros (about $19,350) in Germany, compared with the 12,700-euro starting price for the C3. The SportChic version of the car starts at 19,800 euros.